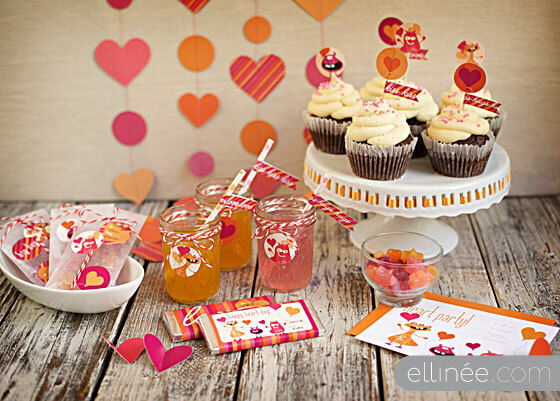 Kara's Party Ideas | Kids Birthday Party Themes: Monster Valentine's Party - FREE downloads! 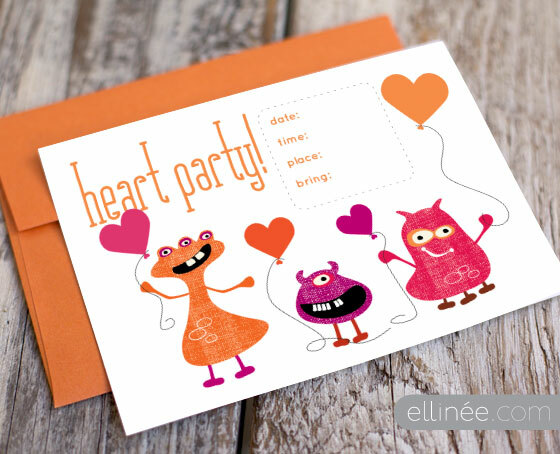 Kara's Party Ideas | Kids Birthday Party Themes: Monster Valentine's Party - FREE downloads! 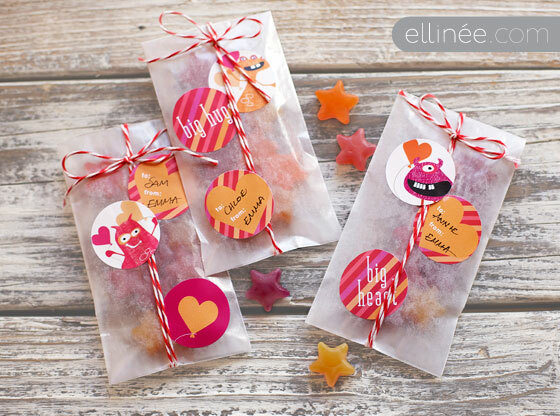 Monster Valentine's Party - FREE downloads! Are you ready for some cuteness? 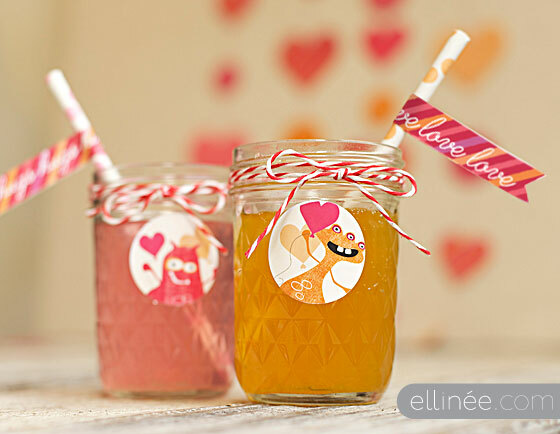 This MONSTER VALENTINE'S DAY PARTY submitted by Lauren Skansgaard of Ellinee is adorable! Who would have thought that combining monsters and Valentines would be soooo darling! And the best part- the whole monster party kit is available to download for FREE! Thanks so much, Ellinee! Be sure and check Ellinee out, they have a lovely paper styling blog. 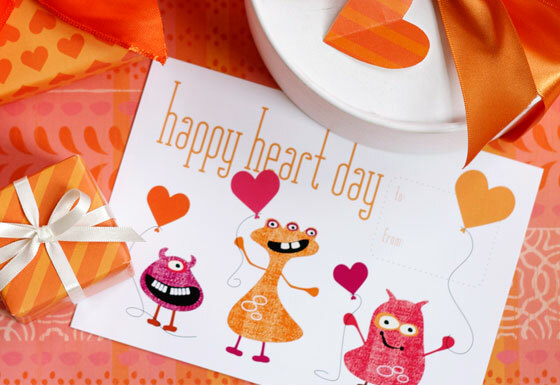 The invitation & the monster valentine’s day card are available to personalize, download and print from shareholidays.com. 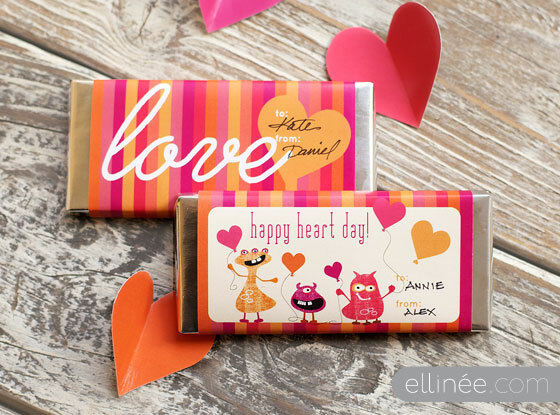 CANDY BAR WRAPPERS: Print PDF pages on 8.5 X 11 inch letter weight stock. Trim and wrap around bar securing ends with double stick tape. ROUND STICKER SHEETS: Open PDF and print. Make sure you select PAGE SCALING = NONE in the print window. (Very important so that the design lines up properly). Print onto Avery 8293 label sheets. Peel and stick to decorate packages, envelopes or anything else. 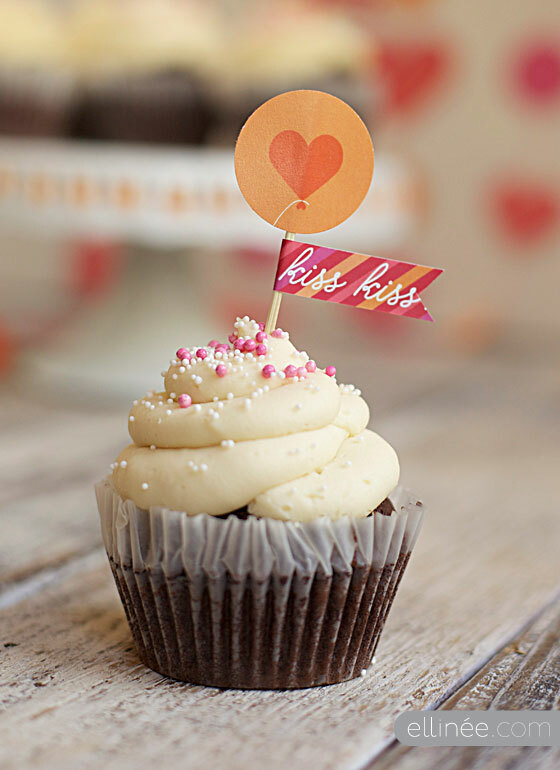 STRAW FLAGS & ROUND DESSERT TOPPERS: Print PDF on either card stock or letter weight stock. Trim flags and fold on dotted line. Open flat and place a 2 inch strip of double stick tape across the fold. Make sure there is no tape hanging off the edges of the flag. Wrap taped area of flag around stick pressing paper together on flag ends. 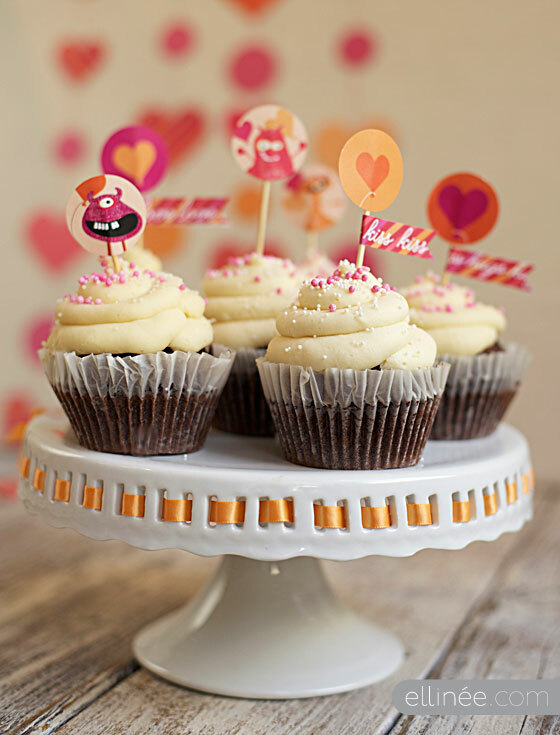 Trim round toppers using a 2″ circle punch or scissors. Using tape, secure onto the top of a toothpick or bamboo skewer. Insert into cupcake or dessert. 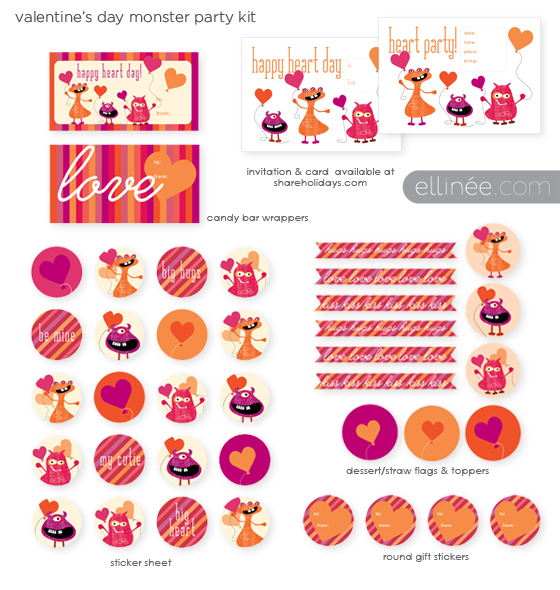 Now just download and print the Free Monster Party kit!" These are so, so cute! I want a monster! this is adorable! wish i had some little monsters around to throw this party for!! will pin it for future use! thank you!